Green Ox 1 meter x 1 meter corrugated pallets serve overseas markets that commonly use this size pallet for product shipment. Just like our standard and custom pallet line, our 1m x 1m corrugated pallet has been rigorously tested using ISTA guidelines by our internal testing lab, assuring pallet performance, product delivery, and supply chain continuity. In addition to our internal testing, we also have clients perform their own tests specific to their product, load weight / distribution, load configuration, shipment type, unification, and pallet use. 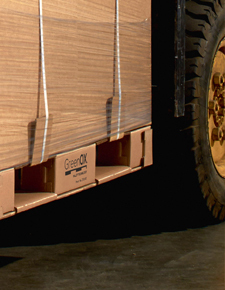 Green Ox 1m x 1m corrugated pallets can be manufactured anywhere with delivery options that meet just-in-time provisioning as flat or assembled pallets in any size and quantity. To contact EcoPallets, our provider of Green Ox 1m x 1m corrugated pallets in East Africa, click here.